What happens when you cross the World’s Fair with a garden expo and shake it all up with Dutch organisation and ingenuity? 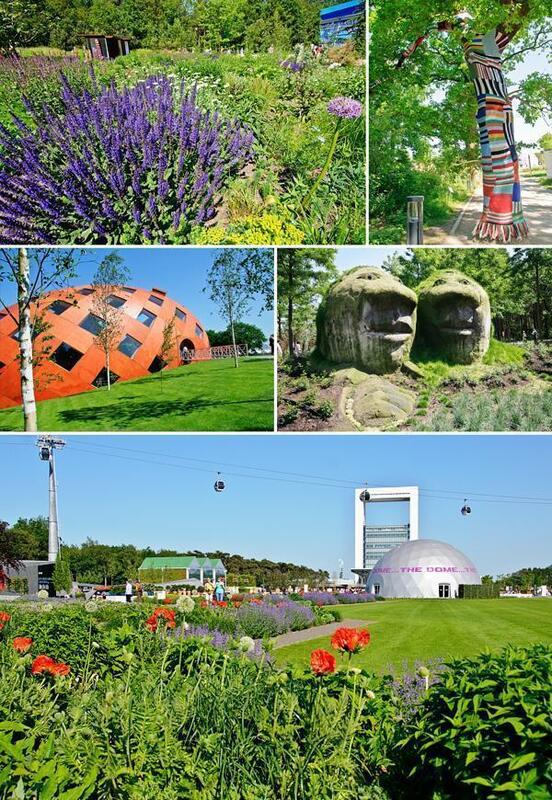 You get Floriade – The World Horticultural Expo in Venlo, the Netherlands. 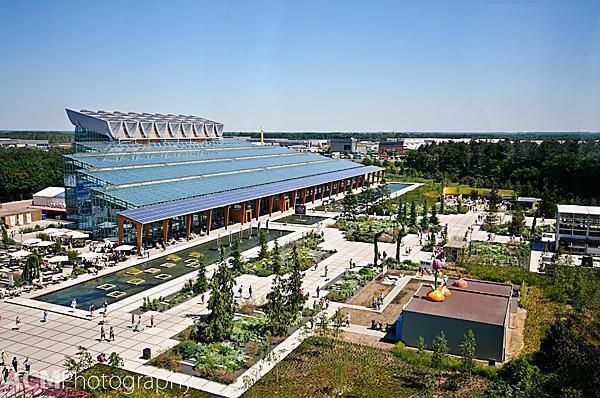 When I first heard about the Floriade garden expo, I knew I would have to attend. This huge horticultural event happens only every 10 years, in the Netherlands, and the last one saw over 3 million visitors in 6 months. Andrew and I left Brussels at 8am, last Saturday, to arrive in Venlo for the 10am opening of Floriade. We were immediately impressed by the organisation of this enormous event. Entire new roads and parking lots were constructed and a super-efficient shuttle system was ferrying visitors from their cars, to the main gates. I wasn’t entirely sure what to expect when we first arrived at Floriade, but I do know it wasn’t what I saw spread out over 66 ha in front of me. In fact, what we saw looked like a small city, with restaurants, gardens, pavilions and performers all laid out before us. Where to begin? As we entered the impressive main gates and tried to get our bearings on our visitors’ map, we saw some interesting characters headed towards us. 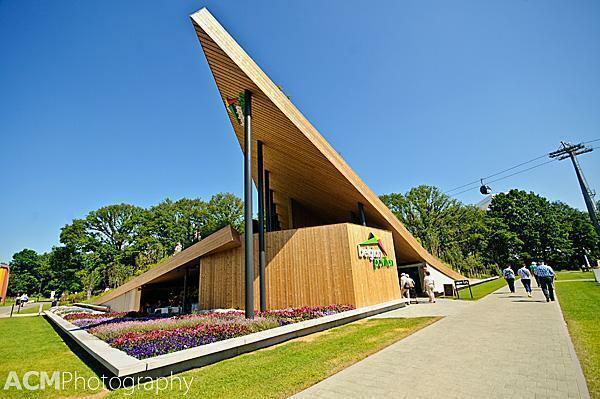 In fact, Floriade boasts entertainment in the form of acrobats, musicians and performers from around the world. Being the travel and culture junkies we are, we decided to first make our way towards the World Show Stage section of the park; one of five ‘themed worlds’ created inside Floriade. 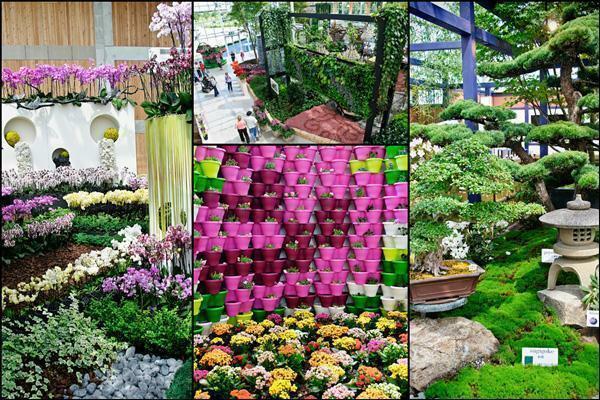 Being a horticultural expo, we were slightly disappointed to find less an ‘international garden’ and more an ‘international shopping bazaar,’ but seeing the themed pavilions from around the world, was interesting nonetheless. We happened upon the Belgium pavilion, one of the larger and more elaborate buildings on display (why to go Belgium!) and decided to check it out. In true CheeseWeb style, we stumbled into a Wallonian wine tasting event, just in time to try 3 of Wallonia’s finest wines. After chatting with the hosts, we decided 3 courses of wine probably wasn’t the most ‘well balanced’ breakfast we could have, so we made our way to the Aqua pavilion restaurant for a bite to eat. With food in our bellies, we decided to get an overview of the expo grounds from the gondola running above the site. It was a great way to see all of the pavilions on offer and pick out where we wanted to head next. The gondola deposited us in the ‘Relax and Heal’ world, where we discovered several Asian Zen-gardens, the ‘Healing Dragon’ and some other cozy corners to relax in. Inside Villa Flora we discovered some striking floral exhibits. 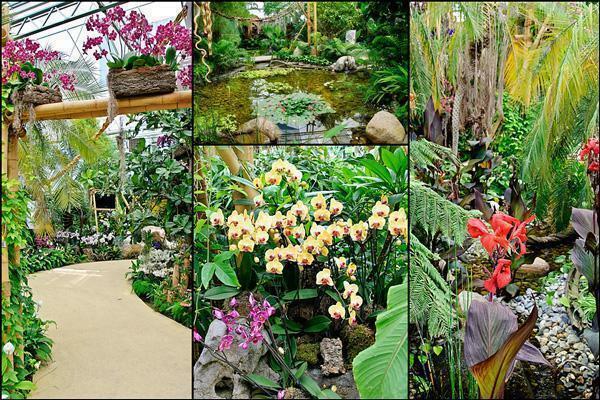 There was a wide variety of orchids and bonsai, as well as floral arrangement displays. Upstairs were more international pavilions, including Bhutan, Japan and Mexico. From the ‘Green Engine,’ we headed towards ‘Education and Innovation.’ Here we discovered the Netherland’s ‘My Green World’ pavilion, the ‘house of taste,’ showcasing a wide variety of Dutch produce, and one of our favourites, the ‘tropical treasures’ pavilion. As we made our way back to the main gate, we wandered through the ‘Environment’ world. 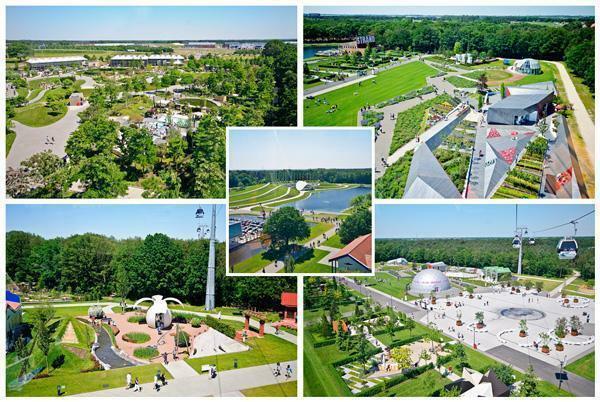 Here we found another favourite in the ‘Rabo Earthwalk,’ which offered a birds-eye-view of the world, through a fantastic video presentation, followed by a great view of Floriade, from the roof. We found ourselves leaving as the park was closing and we still hadn’t seen absolutely everything. As the summer progresses, the opening hours extend. We both feel it would be nice to return later and spend an evening in the park. Our overall impressions were positive, although both of us expected something a bit more like the Keukenhof. There were not nearly as many gardens or flowers as I expected, but it was an enjoyable day either way. We hope to return later in the summer to enjoy more of the performances and spend a more relaxing day rediscovering some of our favourite displays. Although there weren’t as many as we expected, we did find some beautiful blooms at Foloriade. Floriade is located in Venlo, NL, about a 2 hour drive from Brussels, Belgium. The expo area is well sign posted with brown ‘Floriade 2012’ signs from all of the highways through the city. Shuttle buses are also available from the Venlo train station to the expo grounds. 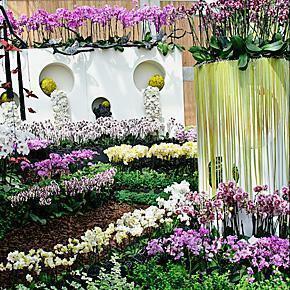 For even more photos from Floriade 2012 in Venlo, be sure to Like us on Facebook!